Phalaris proves profitable in cracking clay. Site focus: To investigate the costs and benefits of establishment and management of phalaris and perennial ryegrass in difficult black cracking clays. Soils: Basalt country with loams to heavy clay soils and some rocky areas. 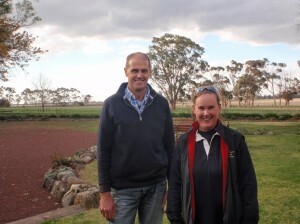 Peter and Regina Dooley run a mixed farming operation near Colac in south west Victoria. The soils on their basalt landscape vary from loams to heavy, cracking clays, with some rocky areas. Low lying areas of the farm have sodic soil that is dispersive and poorly structured, and salinity can further reduce productivity. This country performs well when sown to annual ryegrass, but the Dooleys were looking for a productive perennial pasture system to reduce the workload at busy times when labour is at a premium and best spent on the cropping enterprise. They also wanted to avoid the need to re-sow pasture every year, especially after a wet summer when the ground became difficult to sow into. The Dooleys were therefore keen to host an EverGraze Supporting Site to see if perennial pastures could be established and made to persist on areas with these difficult soils. Prime lamb production is the main enterprise on the Dooley’s property ‘Brolga’, supplemented with dairy heifer agistment and about 200 ha of cereal cropping. Over the years, the high performing lamb production system combined with good grazing management has justified the routine establishment of improved perennial pastures. Most of the pastures on the property are phalaris and ryegrass based, with various clover species also in the mix. The stock are run under an intensive rotational grazing system, with the animals shifted onto fresh pasture anywhere between once a day to once a week, depending on the growing conditions. Paddocks are rested for up to 70 days during winter and summer, with shorter rotations when it’s growing in autumn and spring. While the property is reasonably fertile, the Dooleys do about 10 soil tests each year before applying fertiliser and other soil additives as needed. “I generally end up applying about 200 kg/ha single super to most of the grazing paddocks each year, which allows us to carry up to 18 DSE/ha on the better areas of the farm,” Peter said. While the Dooley’s can get perennial pastures to establish and persist over much of their property, there are about 140ha with heavy, black, sodic, dispersive, cracking clay soils which are prone to waterlogging and patches of salinity. It was in one of these areas that the EverGraze Supporting Site was established. In the past, the 32 ha site selected for the demonstration, was regularly sown to annual ryegrass as this was the only pasture Peter believed would germinate easily in the tough conditions. “These pastures would give us some grazing in autumn if there was an early break, but often none over winter as they became too wet. We would then cut for hay during spring and feed it out elsewhere on the property as needed,” Peter said. By the time the Supporting Site commenced, the ryegrass content had significantly decreased, leaving bare ground with small areas of annual weeds and tall wheat grass. The Supporting Site was split into three 16 hectare paddocks to include a control paddock and two treatment paddocks. Gypsum was applied to counteract the excessive sodium in the soil and prevent soil surface crusting, enabling seeds to germinate successfully. Phosphorus was initially applied to all paddocks to raise the Olsen P level from 7 to 12 mg/kg. The aim for the first treatment was to use the phalaris as a deep-rooted perennial that would prevent the soil from getting waterlogged and could tolerate the dry, cracking clay over summer and autumn. The second treatment was sown using the same sub-clover species but with a mid-season flowering perennial ryegrass (Extreme AR37). This mix is much more typical for this district, and is recommended for 400-700mm rainfall areas. Table 1: Establishment, species and rates sown in treatment paddocks during April 2009. Disc harrowed summer and autumn. During the first year of the Supporting Site, the phalaris establishment was lower than ideal at 11.6 plants per square metre, rather than the 16-20 plants/m2 they were hoping for. “In contrast, the level of perennial ryegrass establishment was quite good, and there was a significant amount of annual ryegrass across the two paddocks,” Raquel Waller (Site Co-ordinator) said. The site received 30mm of rain just after sowing which meant a crust formed on top of the soil in these paddocks. The phalaris seedlings struggled to get through this crust, but the rye did not have this problem. Once it got going, Peter was particularly happy with the performance of the phalaris, which has grown well, established large individual plants and has reliably sent out new tillers. Although it established well, the perennial ryegrass performance has been less impressive than phalaris, especially in later years. Despite the soil improvements made to the site, tests and observations show the site continues to have low fertility, poor structure and remains sodic, all of which could be reducing the productivity of the perennial ryegrass. Olsen P remains below our target of 12 mg/kg. This combined with poor soil structure due to the low calcium:magnesium ratio, and high sodium causes dispersion in the soil, limiting the movement of air and water around the plant’s root zone. The amount of grazing achieved from each paddock in the Supporting Site was similar, despite the different characteristics of the two perennial species. The ryegrass had good plant numbers but was only productive during spring. The phalaris had fewer plant numbers and was slower to establish and reach full production, but had a longer growing season than the perennial ryegrass, providing feed from autumn to spring once established. Peter believes both Supporting Site paddocks now have the potential to carry about 6-7 ewes/ha, with the phalaris slightly higher than the ryegrass. If one ewe is 2 DSE, this equates to 12-14 DSE/ha compared to the 5-6 DSE/ha this area could carry previously. Peter was disappointed at the clover content in each paddock, which remained at less than 5% at each of the annual composition counts and performed poorly throughout the year. In addition to the cricket damage, soil-related factors undoubtedly contributed to the poor performance of the clover. The soil’s high sodium content caused a crust to form on the surface, resulting in no tilth for the clover to set seed in. The problem was compounded by fact that the soil’s Olsen P levels remained low (6-9 mg P/kg) and molybdenum levels were also low. 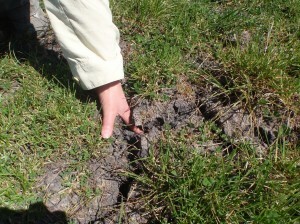 Whilst the phalaris held the soil together, the ryegrass site (pictured) cracked as before. Another interesting result Peter observed at the Supporting Site was the difference in the amount of soil cracking that occurred between the ryegrass and phalaris paddocks. Other explanations may be the micro-topography of the site, including local wetting and drying areas, the deep-rooted nature of the phalaris holding the soil together, and the different structure and clay content of the soil within the site. Peter was very happy he tried the phalaris and perennial ryegrass on this difficult soil site and has learnt a lot from soil preparation, sowing and species comparisons. In recent years, Peter has been trialing and refining a method for establishing phalaris more successfully in this country. By spraying, smudging and then sowing annual rye in year 1, with a follow-up light smudge in years 2 and 3, an even, weed-free tilth is created for phalaris establishment in the autumn of year 3. The annual rye provides a bulk of feed quickly and lasts for two years if allowed to set seed. Pastures established using this method are carrying 18 DSE/ha. Peter may drill perennial ryegrass into these new pasture paddocks once the phalaris is established, and may also try other phalaris varieties or a tall fescue in the future. Cumulative net cash flows and estimates of return on capital invested were used to assess the affordability and value of the pasture improvement. Establishing phalaris successfully in this challenging country cost at least $600/ha plus the cost of purchasing the extra stock to utilise the feed. Despite the high cost, productivity lifted from 5DSE/ha to 12-18 DSE/ha. This gave an estimated Return on Capital of 14% when establishing phalaris in the first year and up to 26% when using Peter’s establishment technique of sowing annual ryegrass in the first year and using less intensive cultivation. A good understanding of the soil is critical when selecting pasture species to establish at a site. The Warncoort EverGraze Supporting Site shows that while phosphorus is important, other soil factors may need to be addressed, in this case soil texture and sodicity. If either the calcium:magnesium ratio (Ca:Mg) or the Exchangeable Sodium Percentage (ESP) measurements are outside of the ideal range, then there is a tendency for the soil to disperse. The clay in the soil blocks the path of water and air, which is detrimental for plant growth and when the soil dries it is likely to form a soil crust. Table 2 shows that both the calcium:magnesium ratio and sodium levels for the site were well outside ideal ranges. selecting pasture species to establish at a site. Soil types varied significantly at Warncoort and phalaris proved itself on the heavy, dark sodic areas. In soils that have not been disturbed for many years such as a pasture paddock, the plant roots and resulting organic matter may be enough to hold the soil together. However cultivation or compaction of the soil can break these physical bonds and then the soil may disperse. Gypsum readily increases the calcium ratio and dissolves rapidly in water. It is usually applied at rates between 2.5 and 5 t/ha. The 2.5 t/ha of gypsum applied to the Warncoort site was sufficient to enable seed establishment, but it was deemed impossible to correct the Ca:Mg ratio and ESP of the soil at the site. This combined with seasonal conditions, meant the new pasture was slower to reach productive capacity but did do so a couple of years later. Establishing phalaris in tough country – is it worthwhile? Establishing perennial pastures can greatly improve productivity of the challenging Warncoort country, but comes at a high cost. Cumulative net cash flows can be used to consider the economic feasibility (or can you afford it) of pasture establishment methods. In this example, we have considered the comparison of either establishing phalaris in year 1 (as in the Supporting Site) with Peter’s new method when established with less cultivation after annual ryegrass (Best Bet system). Return on capital, expressed as Internal Rate of Return, then provides a guide as to whether the investment is worthwhile. The 10 year cumulative net cash flow shows the annual cash flow associated with an investment. In this case the investment options at the Warncoort site are ‘establishing phalaris in the year 1’ and ‘Peter’s Best Bet system’ (annual ryegrass in the first year and phalaris in the third year). A cumulative net cash flow shows the annual cash flow associated with each improved pasture investment option over the life of the investment. The cash flow includes the capital and extra maintenance costs associated with improving the pasture, purchase of extra stock and interest costs to allow for the borrowing of all the capital plus all the additional costs and income associated with the extra stock that are run on the paddock. In this analysis, the extra costs and income of the pasture investment are presented on a per hectare basis. 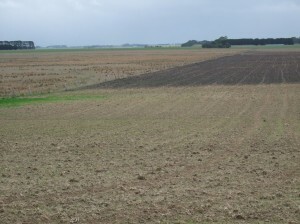 The implications of sowing down a portion of the farm need to be estimated and considered. This includes the total effects on farm cash flow and the implications for total debt. Adding the cumulative costs and income associated with the paddock and enterprise provides a guide to the time it may take to return to positive cash flow. Some sensible decisions can then be made about whether the full cost of the pasture establishment and the initial negative cash flow is affordable. Figure 1 shows the cumulative net cash flows per hectare for both establishing phalaris in year 1 and for Peter’s Best Bet system. To standardise the enterprise returns, the long term average for prime lamb enterprises in the south west Victoria (41 year average) of $30/DSE has been used from the Livestock Farm Monitor Project (2010-11) Report. Actual costs (at contractor rates) have been included for weed and pest control, soil preparation and conditioning, and sowing. Annual maintenance fertiliser costs for both phalaris paddocks from Year 3 onwards are 200 kg single superphosphate (1 kg phosphorus per DSE at 18 DSE/ha) costed at $68 /ha ($380/t super spread), compared to 70 kg/ha single superphosphate at $27/ha for ‘business as usual’. Purchase of additional crossbred ewes to utilise the extra feed are costed at $154/ewe ($64/DSE). The total costs for the first three years were $797 for Peter’s Best Bet system of phalaris establishment and $695 when the phalaris is established in Year 1. When phalaris is established in year 1, there is an associated loss of production until pasture is established (3 DSE/ha compared to the ‘starting base of 5 DSE/ha). It has been assumed that the stock could be carried on the rest of the farm so the only cost incurred is in a loss of production. If large areas of the farm are improved like this then a cost to feed or agist the stock would need to be included. Due to extra stock purchased in the first year of Peter’s Best Bet system, a cost of supplementary feeding ewes (2 kg/ewe/week for 4 months at $300/tonne) has been included for the extra ewes in year three when the second phase of pasture is established. Based on the costs, returns and assumptions outlined above, the cumulative net cash flows for the two phalaris establishment options at Warncoort are shown in Figure 1. 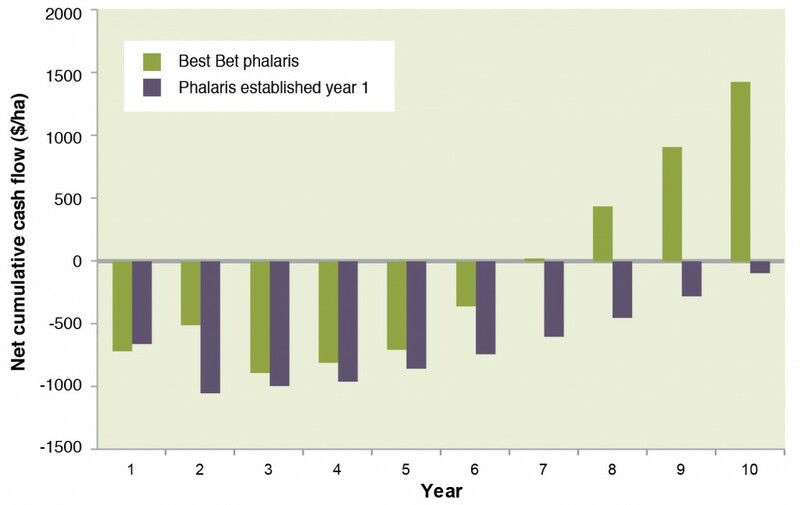 This shows that for the phalaris establishment in year 1, the peak debt is in the second year after establishment (due to the purchase of extra stock) and that it will take ten years for the investment to pay for itself. This payback appears slow due to the cost of purchasing more stock plus the 8% interest cost on money borrowed. If ‘business as usual’ has lower returns per DSE as well as lower stocking rates than the improved pastures, the returns from the improvements would be higher and payback quicker. For example, if the starting production was 5DSE/ha and only returned a Gross Margin of $15/DSE (due to poorer quality feed and shorter growing season) the payback period would be reduced by several years. Peter’s Best Bet system peaks in debt in the third year and the investment has paid for itself by the 7th year. The lower debt and better returns from Peter’s Best Bet system rely on the purchase of extra ewes early in the first year. The peak debt is in reality greater early in the first year due to up front purchase of ewes and pasture costs (total $1018/ha) before the extra returns are made. This is compared to the expenditure in the phalaris in year 1 system of $600/ha. Cash flows alone do not tell us whether either of these options are a good investment. The common measure that is used to help decide whether an investment is worthwhile is return to the marginal capital invested, called the Internal Rate of Return (IRR). The IRR is a measure of the economic efficiency of the investment over a set period of time, and can be compared to returns from alternative investments of the same capital, with a similar life and that are similarly risky. The IRR accounts for all the income generated over the period, less the costs of the improvements. It also includes a salvage or depreciated value of the capital investments (such as livestock, fencing and pasture improvement) at the end of the time period. 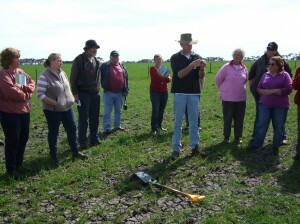 Ten years is common for pasture improvement programs. Table 3. Gross Margin and Return on capital (IRR) estimates for the two phalaris establishment options at Warncoort, compared to business as usual. Increasing stocking rates significantly across the farm may increase labour and overhead or infrastructure costs as well as potentially increased exposure to tough seasons, and these should be considered before making large scale improvements. For a simple cost-benefit analysis of pasture improvements, use the EverGraze Pasture Improvement Calculator. Thanks are extended to Peter and Regina Dooley for hosting the Supporting Site. This site was supported by Caring for Our Country, Central Highlands Agribusiness Forum and Future Farm Industries CRC through the National EverGraze Project.